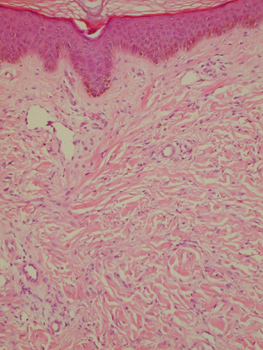 HISTOLOGIC FINDINGS: The histologic features are characterized by some degree of thickening and fibrosis of the dermis. The collagen bundles are separated by thin spaces or clefts which represent fluid and/or mucin deposition. (See microscopic pictures). Among the collagen fibers there are elongated dendritic cells that are positive with CD34 immunostaining. FXIIIa positive cells are also present. The elastic fibers are somewhat increased and prominent as seen with elastic tissue stains. There is remarkable absence of inflammation throughout the biopsy. COMMENT: NFD has been associated consistently with renal disease. Clinically it should be differentiated from scleredema, scleromyxedema, systemic sclerosis and morphea, eosonophilic fasciitis and eosonophilic myalgia syndrome. Of all the previous entities, only systemic sclerosis is also associated with renal failure. 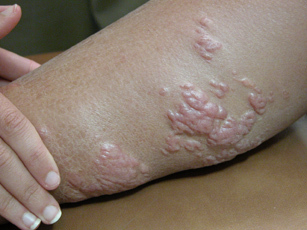 This clinical condition resolved in some patients after returning to normal renal function. REFERENCE: Cooper, S.E. ; Lyndon, D.S., et al. 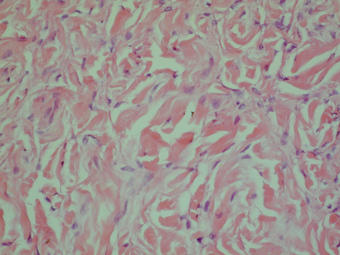 Nephrogenic fibrosing dermopathy. Am. J. Dermpath. 23(5): 383-393, 2001.